Holiday Package Deals | $149.90 per pax for 3D2N stay at Paya Beach Spa & Dive Resort with Daily Breakfast, Return Ferry & Transfers! $149.90 per pax for 3D2N stay at Paya Beach Spa & Dive Resort with Daily Breakfast, Return Ferry & Transfers! Explore the beauty of TIOMAN ISLAND, Malaysia with this for 50% off! At PAYA BEACH SPA & DIVE RESORT, you can turn your vacation into an adventure with Paya Adventure Safaris or with the resort's available diving packages! Tioman is in Pahang ("East Coast") within the Mersing Marine Park, which contains less commercial islands such as Sibu Island. In the 1970s, TIME Magazine selected Tioman as one of the world’s most beautiful islands. The densely forested island is still sparsely inhabited. 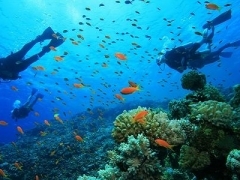 Also it is surrounded by numerous white coral reefs, making it a haven for scuba divers from around the region. You will find enormous monitor lizards across the island and in the kampongs you will often see them sifting through the rubbish piles looking for food. There is also an abundance of domestic cats. Local transport is by bike, cars at Tekek, and by boat. A concrete road runs through Tekek, extending from the Berjaya resort in the south, past the airport, and to the northern end of Tekek village. There is a concrete path running the length of Air Batang area. The perfect idyllic getaway to enjoy Nature's gift. White sands, turquoise water, unforgettable experiences. Tioman Island is a volcanic island covered in rainforest. This pear-shaped drop of veritable paradise with spectacular flora and fauna packs a variety of streams and cascading waterfalls. Nestled in a secluded beach with rooms overlooking South China Sea, this magical atmosphere awaits you at Paya Beach Spa & Dive Resort. Located beachfront, Paya Beach Spa & Dive Resort features 6 types of Malaysian-style chalets, each with their private balcony. Every room offers spacious, comfortable accommodation with stylish interiors. Amenities include air-conditioning, coffee/tea making facilities, cable TV and bathroom.